Sarasota philanthropists Carol and Barney Barnett donated $3 million as a part of the Campaign to help Mote implement its Fisheries Conservation and Enhancement Initiative to protect and restore fisheries in Sarasota Bay, with an expectation that others in our community will step up to provide support for to this initiative as well. Snook are a focus of this initiative and one of the most sought after catches in Florida’s saltwater recreational fishing industry. According to the American Sportfishing Association, Florida is the top-ranked state in economic output from recreational fishing, which draws more than $8 billion to the economy annually. Saltwater fishing alone generates about 80 percent — more than $6 billion — of that income. In 2015, Mote scientists and Florida’s Fish and Wildlife Conservation Commission (FWC) scientists placed about 400 tagged, hatchery-reared juvenile snook into Sarasota Bay as part of an ongoing research project focused on finding the most effective methods to replenish and enhance wild snook populations. That experiment was a prelude to experiments planned for summer 2016, when over 15,000 hatchery snook will be tagged and released. This research is evaluating which natural snook nursery habitats are most important in producing adult snook in Sarasota Bay to provide critical knowledge for sustaining the local snook population. Mote welcomed Dr. Ryan Schloesser in September 2015, a postdoctoral scientist who, enabled by the Barnett’s donation, joined the Fisheries Ecology and Enhancement Program to help further develop and test responsible stock enhancement technology for restoring depleted snook and to advance knowledge about wild snook. Also as part of the Initiative, scheduled for April 8-9, Mote will be hosting the William R. Mote Memorial Snook Shindig honoring Captain Scotty Moore – a catch, sample and release tournament targeting snook released by scientists from Mote’s Fisheries Ecology and Enhancement Program and our colleagues at Florida’s Fish and Wildlife Conservation Commission. 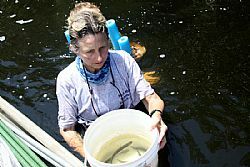 Photo: Carole L. Neidig, Mote Staff Scientist, brings hatchery-reared snook to acclimation enclosures before they are released into Sarasota Bay as part of the Lab's Fisheries Conservation and Enhancement Initiative. Credit: Mote Marine Laboratory.